As the year doggedly grinds its way round its first quarter, and the quiet chill of winter settles over your shoulders, you may find yourself sitting at your desk or in your car, chasing that elusive dream of the next day trip or holiday. For anyone feeling the chill of the longer nights, these books offer a rich sense of place that will transport you to a variety of vividly realised countries, cities and eras. A bestseller in Japan, Natsu Miyashita’s The Forest of Wool and Steel explores how art and place are fundamentally intertwined and immerses readers in the particularities of an relatively little-known art – piano tuning. It starts with teenager Tomura, who discovers his vocation when he hears a piano being tuned and is instantly transported to the dark and gleaming forests that circle his small mountain village. As he grows up, Tomura studies under three very different masters, all the while trying to reach the pinnacle of his craft. Throughout it all, Tomura’s connection to the ethereal qualities of the forest is constant – the dampness of the woodland floor, the earthy smell of the canopies above. The Forest of Wool and Steel is a beautiful and immersive new work of fiction connecting sound and nature. 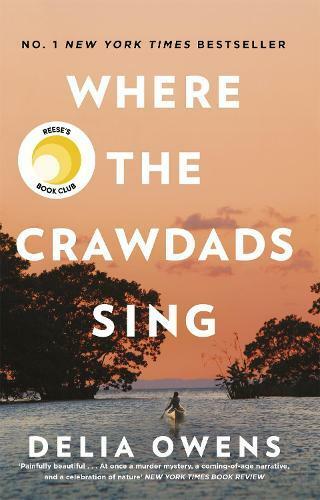 With poetic descriptions of the marshlands of the North Carolina coast, Where the Crawdads Sing is at once an ode to the natural world, a heartbreaking coming-of-age story, and a compelling mystery about a small-town murder. It centres on Kya Clark, the so-called Marsh Girl who grew up learning how to survive among the gulls and fireflies of the marshes after being abandoned by her family. Ostracised by many of the locals, Kya is resilient and resourceful, finding beauty in the bounty that nature provides and the kindness shown by a few compassionate souls. But when the town’s handsome Golden Boy Chase Andrews is found dead, Kya’s isolation and difference make her the perfect suspect. Just how Kya and Chase are connected unfurls slowly to the reader as Delia Owens skips back and forth in time throughout different moments of Kya’s life. What emerges is a powerful and soulful tale of resilience and survival. One of Ann Patchett’s most intriguing novels, State of Wonder is a compelling exploration of womanhood and ambition in the form of a classic adventure. Hidden deep among the tangled waterways of the Amazon rainforest is an enigmatic scientist working on a fertility drug that could change the world. When a young researcher sent to investigate this mysterious project dies, our protagonist Marina Singh is sent to retrace his steps and uncover what happened. Patchett’s writing in this thrilling adventure is feverish and intoxicating; the unknown mysteries of the humid jungle arise out of the pages, insinuating their way into the crevices of your imagination. There are some places on this earth that feel almost alien and otherworldly in how remote they are from our industrialised lives, and Patchett captures all the wonder of encountering such an environment here in this book. There are traces of Joseph Conrad’s Heart of Darkness too (with, yes, all its colonial implications), but Patchett takes care to invert the reader’s expectations and deftly avoids creating a mere shallow replica of those old stories. A captivating and magical story set in 1930s colonial Malaysia, The Night Tiger follows an apprentice dressmaker (who moonlights as a dance-hall girl) and an orphan boy brought together by a series of unexplained deaths and an old Chinese superstition about men who turn into tigers. Captivating and lushly written, this sensual blend of mystery and mythology explores sibling rivalry, unexpected love, and the clash of local Chinese and Malay traditions, mixing the rich world of ancient superstition and modern ambition. Have you ever looked around in your own town or city and noticed something you’ve overlooked, something that made you think about the history of that place in a new light – a mosaic eleven stories up the side of a high-rise building, an old faded advertisement, an oddly placed commemorative plaque? Vanessa Berry’s collection of essays, Mirror Sydney (based on her blog of the same name), is an encapsulation of that experience. Inside, Berry unearths the overlooked suburban mysteries, the odd hidden stories and anachronistic sites of Sydney. From abandoned amusement parks to mysterious traffic islands; from the railway lost-property office to the elephant buried in Sydney Park, Berry casts an urban archaeologist’s eye on these forgotten and seemingly mundane places, uncovering a shadow city to the Sydney readers may know. For non-Sydneysiders unfamiliar with these places, this is also an eye-opening guide that will inspire readers to be curious and newly observant about the familiar spaces in their own lives. Sandra Newman’s ambitious new novel The Heavens traverses early 2000s New York and Elizabethan London, crafting an epic story of love and alternate universes, madness and time travel. Kate and Ben live in a New York that feels familiar to ours but is different in crucial ways: There is no war, a woman is president, and an air of camaraderie permeates the streets of Manhattan. When Kate falls asleep, she wakes in 1593 London as Emilia – a mistress of a nobleman. Afflicted by premonitions of a burning city, Emilia/Kate sets out to change her visions, but with each act she makes in the 1590s, she wakes to a New York that is altered – veering further and further from the existence she starts out with. Newman’s time-slip plot structure is immediately fascinating and she evokes both New York and historical London beautifully. At just 250 pages, the book doesn’t belabour too much on world-building, but the ideas Newman plays with are concise, smart and complex. This is an ambitious novel that will inspire devoted reactions from readers who like to read big, bold and original works. Following on from the success of the award-winning book Welcome to Country, Wilam: A Birrarung Story is a gorgeous hardcover picture book that follows Melbourne’s beloved Yarra River – Birrarung – as it winds its way down from the mountains to the bay. Written by Senior Wurundjeri Elder Aunty Joy Murphy with Yarra Riverkeeper Andrew Kelly, and featuring beautiful artwork from Lisa Kennedy, Wilam is a captivating introduction to Birrarung for children and adults, and a great way to re-discover a place you think you know. The book also seamlessly integrates Woiwurrung words for common wildlife and plant life into the English text, and Kennedy’s thoughtfully placed images offer context clues to help readers pick up what these words mean without the need for direct translation. Robbie Arnott’s beguiling debut, Flames, is a work of transformation, an Ovidian Metamorphoses that pays homage to the rich landscape of Tasmania. Siblings Levi and Charlotte McAllister come from a family where the women return briefly after they’re cremated, but in altered and changed forms. After witnessing their mother’s return, Levi resolves to build a coffin so that his sister will never have to undergo the same change, prompting Charlotte to run for her life, escaping to the isolated outreaches of Tasmania. Arnott’s genre-breaking mix of different narrative styles is an impressive high-wire act – in one chapter, you get magic realism, in others, gothic horror or hardboiled noir. And this vision of Tasmania is something that feels genuinely new in the realm of Australian fiction, filled as it is with a rich and strange magic that blends of fairytale and myth. This literary debut is suffused with the beauty of nature, and is a must-read for anyone who relishes the immersive power of language. This operatic Belle Époque historical romp stars Lilliet Berne, star soprano of the Paris Opera, who is offered a lead role that comes at a price: the part is based on her deepest secret and only four people could have given that secret away. As she mines her memories for clues, Berne recalls her life as an orphan on the American frontier, and her escape to Europe and the glitzy, gritty world of Paris. In order to survive, she adopts new identities: hippodrome rider, maid, courtesan, singer, all the while weaving a complicated web of romance, obligation, and political intrigue. Stuffed to the brim with melodrama, eccentric characters, false identities and deep dark secrets, this book never goes where you expect. An homage to the grandiose world of the Opera, The Queen of the Night is an epic, ambitious page-turner that will appeal to readers of historical fiction and those searching for complex female characters. Tony Birch’s collection of ten interlinked short stories is a remarkable time capsule of growing up working class in the inner-Melbourne suburb of Fitzroy in the 1960s and 1970s. The stories are all linked to young Michael, who grows up in a neighbourhood of simple pleasures as well as random brutality. As he watches and experiences the trials of his long-suffering mother, the abuse of his alcoholic father and the forces of ‘urban renewal’, Michael starts to form his own priorities, growing into a sensitive adult who can never forget or escape his past. Tough, spare and unflinching, the prose in this collection will transport you to the turmoil and upheaval of a completely different era, capturing the essence of working-class life in Australia. US-born, Dublin-based writer Tana French’s Dublin Murder Squad crime novels have inspired a loyal and devoted following for their well-rounded and realistic characters, psychological depth and thoughtful depiction of Ireland and its history. Faithful Place is the third novel of the series, centring on textbook crime-novel detective Frank Mackey. Grizzled Mackey is a bit of a rule breaker and when a Cold Case turns up that involves an childhood sweetheart whom he thought had left him for England, he returns to the inner-city working class neighbourhood of his childhood to conduct his own inquiries. Mackey’s place of origin – The Liberties in Dublin – is immediately recognisable to anyone who’s grown up working class: the large families and tiny, cramped spaces; the lightning-fast spread of gossip; the deep suspicion of any outsiders and that mixture of pride and resentment that greets the return of prodigal children. Faithful Place is as much an intergenerational drama as it is a mystery, and as French drags her detective unwillingly back into his own troubled history, so too do readers get a sense of the undercurrents of class, progress and prejudice that make up these areas. Browse the collection below for more books that evoke a strong sense of place.